Here are 10 spots where you are likely to capture images of the biggest bucks on your land. How solid are my sources for this advice? The experts quoted here have taken and analyzed hundreds of thousands of cam pictures of mature bucks over the years. Read on and find out where and how to get the buck images. After that, the hanging of tree stands and closing the deal are up to you. Hidden Water: One August in Iowa, Jay Gregory glassed a giant buck in one of his soybean fields. He snuck into a thick marsh less than a half-mile away and set a camera. Over the next weeks he got 5 photos of the velvet buck–not a lot of images, but enough. The picture time-stamped 9:00 a.m. on October 24 was gold–it showed the monster at the hidden waterhole in broad daylight. Jay moved in with a tree stand and arrowed the beast a few days later—it gross-scored 198. 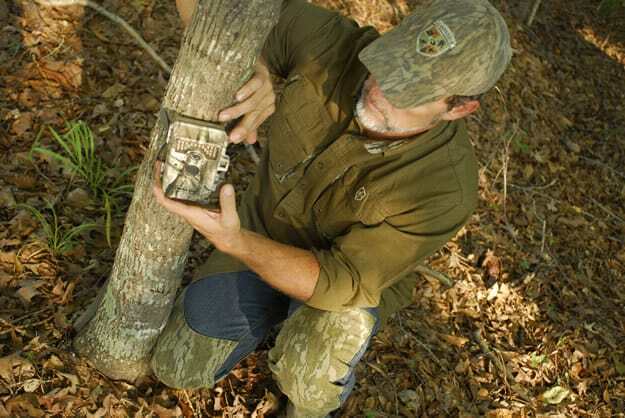 “After spotting a big buck in an agricultural field or food plot, sneak in and set a couple of cameras on well-used trails near the closest river, creek or marsh,” says Jay. “As summer deepens, mature deer spend a lot of time hanging out near water in low-lying areas. If you get lucky and set your cams in the right spot, you can find out where a giant is bedding.” Then plan your ambush on a trail between the bed and the feed. Find a staging area and set a cam on a fresh trail or rub line, or near an oak tree where acorns are falling. If you photograph a good buck, slip in, hang a stand and try to shoot him if the wind and access in the area let you do it. Little Cover: In the book Deer Cameras: The Science of Scouting Wisconsin bowhunter and QDMA member Todd Reabe reveals where he gets amazing daytime photos of monster bucks on his small, well-managed property. And day images are what you want, because that shows when and where you might arrow a whopper when he’s on his feet in shooting light. Todd stays away from field edges and instead aims his cameras into pockets and strips of security cover. “Small funnels and bottlenecks of thick cover between feeding and bedding areas are the best spots for my cams,” he says. Look for these secret cam hotspots on aerial photos and then go in and ground scout. Thick Funnels: Dr. Mickey Hellickson, one of the top whitetail biologists in America, has taken camera surveys for many years on his Iowa hunting property with the sole intent of finding terrains and covers where mature bucks routinely travel. “The spot where we’ve gotten the most mature buck photos is where 2 or more drainages or fingers of timber come together,” he says. Mick notes that these funnels may be large or small, but one constant is thick security cover nearby. Hang cameras near these bottlenecks and you will find big deer. Then cross-reference the photos with aerial maps, consider fresh sign on the ground and hang tree stands for ambushes. Green Timber: Hellickson’s picture surveys have revealed a second great place to set your cameras, especially later in the fall when the leaves blow down and the days get colder. “Our photos show mature bucks regularly use small blocks of timber with evergreen trees because the conifers provide increased security cover late in the year,” he says. Copses or wind rows of pines or cedars also break the wind and provide a warmer climate for deer on cold, north-wind days. Beginning in late November, set a couple of cameras in these habitats and be ready to move in with a stand when a bomber buck shows up. Scrapes: Another of the world’s top deer biologists, Dr. Grant Woods, has analyzed hundreds of thousands of cam photos taken in all imaginable types of habitat from September through January. He says the best place to get buck shots bar none is at scrapes during the rut. Look for big, active scrapes deep in the timber and “monitor them throughout the rut, not just for two weeks during the peak,” he says. Empty Stands: Midwestern hunter Mark Drury often straps cameras on the same trees (or on nearby trees) where he has fixed-position stands. He activates the units when he’s not hunting the stand. If a shooter shows up, he analyzes the time stamp on the pictures with regards to weather, wind direction, etc. He analyzes the directions the deer are coming from or traveling too. “It’s a simple thing that helps me nail down the best time to go back and hunt a particular stand,” says Drury. Pond Dam: Got a pond or lake dam in your hunt zone, or maybe a long, flat beaver dam? “It can be a magical bridge for deer from one block of timber to the next, or from woods to a field where they are feeding,” says Mark Drury. “We set cameras on dams and run them all season. While a big buck might not travel on a dam say in October, he might run it in the rut or in December or January when he’s hitting late-season corn or beans nearby.” Pond dams with tall grass and weeds that can hide a buck as he sneaks around are the best surveillance spots for cams. It’s risky business because you have to sneak in there at least twice—once to set a camera and again to check the memory card–but it can pay off. “Get a picture of a big deer in his bedroom, and you’ve got a huge advantage,” notes Bice. “You get an idea where that buck is moving out of cover at dusk, and where he’s heading back at first light the next morning.” Then hang a tree stand along a nearby trail or funnel for a high-odds ambush. This entry was posted in Big Bucks, BigDeer, Bowhunting, Deer Hunting, Hanback, Trail Camera Photos, Whitetail Tactics by admin. Bookmark the permalink. I’ll tell you another great place to get shots of practically all of the bucks using an area is a large signpost rub in the weeks leading to the Rut, and even after the peak of the rut. You can even initiate your own signpost rub. I like to take my foldable saw and scrape the outer bark of a previously worked signpost rub (one from years past), or even a new tree that hasn’t been hit before. If you choose a tree that hasn’t been hit before, make sure it’s on a primary trail, or on part of a rubline that has been used in the past. If your area doesn’t see any major topographical, or geographical change from year to year, these same trails are used from year to year. Being from Florida where the funnels can get really thick, and where there is minimal public hunting land, I need to really scout the area to have a chance but the terrain makes it difficult for semi frequent trips. I have found that amazon.com often offers some really cheap trail cams, (I bought 3 for $35 each!) and they really do a decent job of letting me know whats cruising the trails. Quite often several trails come out of dense growth into a clearing and these cams keep me from having to walk the muck during rainy season.